The literal meaning of cystitis is the swelling of the urinary bladder. This term in general is applied to any disease which may cause inflammation in the urinary bladder. This dog disease is more common in female dogs but if a male dog is affected then it is more threatening for him. 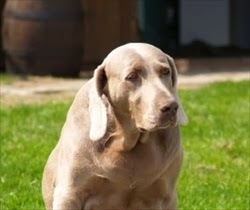 This is due to the fact that the urethra in the female dog is wide and it is difficult for it to be blocked with stones, whereas in the male dogs the urethra can’t dilate and become easily blocked. Urine retention due to the narrowing of urethra from trauma, tumors or calculi. Urine retention because of damage to nerve supply to the bladder from the spinal cord lesions such as infections, tumors and slipped discs. Urine retention because of congenital defects of the bladder. Urine retention from dogs which are forced to hold urine for a long time. Diabetes and other causes of sugar in the urine. Dog’s urine is analyzed to diagnose this dog disease. If the presence of bacteria becomes obvious then culture and sensitivity testing would be done to decide what antibiotics are to be used. X-rays and biopsy may be necessary if the cause of the cystitis isn’t determined. Cytoscopy is also very beneficial in order to diagnose the cause of cystitis. In this a special instrument is used which inspects the lower urinary tract. Treatment depends upon the cause of the disease. Most cases of cystitis are due to bacterial infections and these are easily treated with antibiotics. However, in certain cases a number of antibiotics would have to be tried before an effective one is found and this may take some time. If the cause is bladder stones then in some cases those can be easily removed with special diets; whereas others may have to be removed by surgery. Benign bladder polyps are also removed surgically. In severe cases pain relievers, urinary antiseptics and antispasmotics may be given in order to relieve the symptoms. In order to avoid the stagnation of urine, the owner should give loads of salt to the dog in its food. This would lead to increased drinking and increased urination, which would keep the bladder flushed out.